Visit here to find out where to buy Vireyas and learn more about these beautiful plants. Our Guest Speaker for Sat 15 June, Neil Puddey is a past winner of the Spring Garden Competition and is also a local hero as far as growing Vireya Rhododendrons is concerned. These beautiful plants in the wild are centred in the botanical region known as 'Malesia'. They are a highland tropical plant with about 170 known species. The first Vireya description was published in 1822 based on material supplied by an East India Company employee, William Jack while working in Sumatra. Neil has successfully grown vireyas and has exported them to 12 countries - including 855 vireyas used in the beautiful Gardens by the Bay in Singapore see here about Neil and the gardens. Neil was very generous with his knowledge on how to care for vireyas and he mentioned there is a vireya for every situation as they range from small mound-type to tall 4m high specimens, some of which are scented, mainly the pinks and whites. Neil mentioned that considered plant selection for situation was most important. Vireyas may be grown directly in the ground however, they need very good drainage and aeration. Plant on the ground and build up the bed with mulch and feed through winter with slow release fertiliser - leaves should be dark green, if they are yellow there is an iron deficiency - this should be taken care of by the application of the slow release fertiliser. Vireyas require filtered light or sun for at least half a day. When growing in a pot do not have the pot sitting in a tray as the potting medium must be extremely well drained; Neil uses perlite in his mix (or styrofoam) to assist good drainage. When potting on do not put into a too big a pot - it is best to leave the top exposed from the old pot and build up with mulch for good drainage and aeration. Pests - Neil says that these things won't necessarily kill the plant but will most certainly affect the appearance: lacebug, petal blight, mealy bug, mites, thrips - these can be addressed by using Confidor mixed with a penatrent which will assist with absorption. Root rot - this is a real problem with Vireyas which are vulnerable due to poor drainage and/or aeration. This phytophthora root rot, is a fungal disease which infects fine roots and root hairs of plants and if left untreated can cause the demise of the plant. This can be treated with a suitable anti rot application like Phosacid 200 or Foli-R-Fos 200, these both have phosphorous acid as the active ingredient. With regard to pruning Neil said with the more compact mound-type ones there wasn't any need to prune. However the more open ones require pruning to just above leaves. In tall ones that have lost their leaves, crack the stem just above where the leaf nodes are, this can be easily seen on the stem as a slight swelling or scar. This system should produce new growth in about a month during summer. 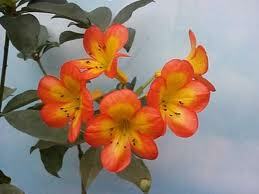 The vireya is a social plant in that it loves to have company, so best to grow a ground cover with it. Neil provided an opportunity for members to purchase the large variety of plants he had brought to display. It was a very interesting talk and yet another wonderful speaker at our meeting.